Ava Jenkins and Margaret Morrison in Home in Her Heart. Photo by Keith Gemerek. 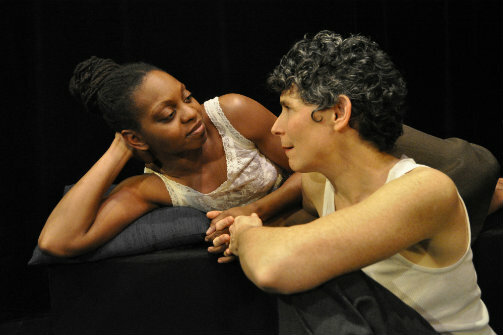 BOTTOM LINE: An interracial lesbian couple in 1939 is forced to relocate from Europe to the segregated United States. While this play is full of heart, it's hard to get totally invested in the characters' struggle. Home in Her Heart, a two women play by Margaret Morrison playing an encore engagement with a revised script at Stage Left Studios, takes place in London in 1939. African-American widow Claire Hicks (Ava Jenkins) plays the piano for Jimmie LeRoy (played by Morrison), an aging yet charismatic white male impersonator. The two women, both American expatriates, are a lesbian couple who lead a wonderful life full of love and artistic fulfillment. However, when Hitler threatens war on Britain, the British Embassy demands that all Americans leave the country. This forces Claire and Jimmie to return to an America that, in the era of Jim Crow, won’t necessarily be kind to interracial couples, especially lesbian ones. Both of them take the impending move in their own conflicting ways. Jimmie, an eternal optimist, believes that love will see them through the end of their days. Claire, however, has seen from history that love can’t always defeat bigotry, injustice, and enslavement. Even Jimmie does her fair share of oppression -- she (successfully) passes off Claire as her servant girl in order to ensure that they’ll end up in the same room on the ship to America. This understandably angers Claire, and sets off the central conflict of the play: Will these two women, from conflicting backgrounds, be able to make their life and love work in a segregated country? The underlying tensions between them explode in a scene about halfway through the play in which Claire receives a rather nasty letter from home, and the stability of their relationship is called into question (“You can’t let Jim Crow rule your life!” Jimmie says exasperated. “Jim Crow is my life!” Claire replies). On its own, the dynamic between Claire and Jimmie is fascinating and original. Playwright Morrison allows the audience plenty of time to get to know these characters and how they met. However, in order for a play like this to work, we need to root for the two characters to work out their kinks and flaws. Neither actress fully embodies what their character stands for. While Morrison (who taps well in the opening) and Jenkins are passionate performers, they never seem to play beyond the surface of their characters. It also doesn’t help that there is some rather modern-sounding dialogue in the text. Granted, I wasn’t alive in 1939 England, but I’m not sure if phrases such as “green light” and “dump me” were used back then. Ellen Rosenberg is the technical director of the play. She helps the minimal set seamlessly transition from an apartment to a nightclub. The costumes, designed by Cheryl King, gently evoke the time period. Pre-recorded piano solos are provided by Cynthia Hilts. They are very cleverly used when Ava is writing down music in her head. Home in Her Heart, indeed, has plenty of heart. It is sincere, means well, and has an interesting and original idea -- while shows such as Rent and If/Then feature interracial lesbian couples, very few put them at the forefront. I didn't see the previous draft of this script, so I'm unable to compare the revisions. However, judging solely from the 85 minute version, Home in Her Heart still has a bit deeper to go if it wants to be the shot to the heart that it wants to be.